And now to Korea. A week of twists and turns on the Korean Peninsula is ending on a hopeful note. Yesterday, leaders of the rival Koreas met for an impromptu summit at their shared border. As NPR's Elise Hu reports, they're trying to salvage a recently scrapped summit between Pyongyang and Washington. PRESIDENT MOON JAE-IN: (Speaking in Korean). ELISE HU, BYLINE: South Korea's president, Moon Jae-in, appeared before cameras to talk about his surprise secret Saturday summit with Kim Jong Un. He says Kim reached out on Friday to ask for a face-to-face meeting. And by the next afternoon, the men managed to meet up. 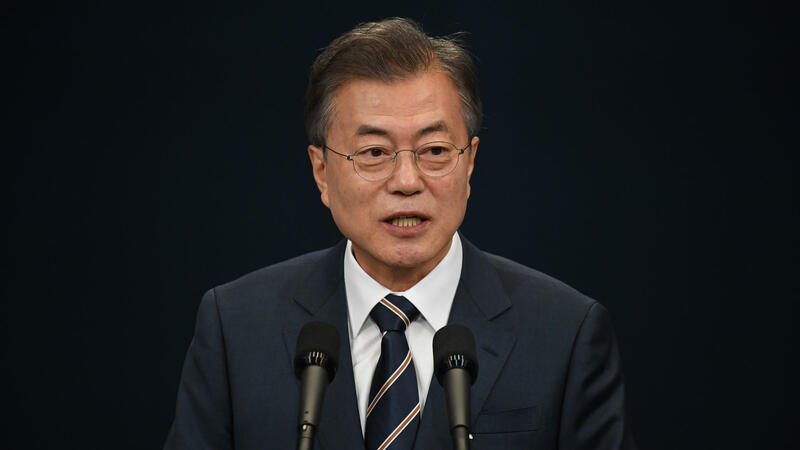 Through a translator, Moon said Kim's recent commitment to denuclearization remains. MOON: (Through interpreter) What's uncertain for him is not his intentions for denuclearization but Washington's stance in hostile relations with North Korea and whether Washington can really secure and guarantee its regime. HU: This second meeting in two months happened after President Trump abruptly called off a scheduled U.S.-North Korea summit on Thursday. Just last night, the U.S. president said things might be back on. PRESIDENT DONALD TRUMP: So we're looking at June 12 in Singapore. That hasn't changed. HU: The off-again on-again diplomacy is making many Korea watchers dizzy, says The Heritage Foundation's Bruce Klingner. He's a former CIA analyst on the Koreas. BRUCE KLINGNER: It's really gotten to the point where if you walk away from your computer or your Twitter feed for more than about 10 minutes, you find yourself hopelessly out of date. HU: Moon Jae-in says he pressed with Kim that direct communication with the U.S. is key, and a lot of that will be needed to work out specifics. When Moon was asked whether Kim supported the U.S. definition of denuclearization, which is an irreversible verifiable giving up of nuclear arms, Moon said that's up to Washington and Pyongyang to work out. Bruce Klingner. KLINGNER: The two sides are still very wide apart on what they feel denuclearization is. HU: Whether they can bridge that gap in the coming weeks is the question holding up a Trump-Kim meeting. Both Korean leaders say they're invested in making that summit happen. Elise Hu, NPR News, Seoul. Transcript provided by NPR, Copyright NPR.